Finance Mathematics is devoted to financial markets both with discrete and continuous time, exploring how to make the transition from discrete to continuous time in option pricing. 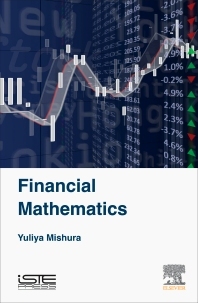 This book features a detailed dynamic model of financial markets with discrete time, for application in real-world environments, along with Martingale measures and martingale criterion and the proven absence of arbitrage. With a focus on portfolio optimization, fair pricing, investment risk, and self-finance, the authors provide numerical methods for solutions and practical financial models, enabling you to solve problems both from mathematical and from financial point of view. Yuliya Mishura is Professor and Head of the Department of Probability Theory, Statistics and Actuarial Mathematics, Faculty of Mechanics and Mathematics, Taras Shevchenko National University of Kyiv, Ukraine. Her research interests include stochastic analysis, theory of stochastic processes, stochastic differential equations, numerical schemes, financial mathematics, risk processes, statistics of stochastic processes, and models with long-range dependence.